Hundreds of years ago, this sword would have been carried proudly by the fiercest of warriors. It features authentic details like a heavy blood groove to catch the blood of slain enemies in battle and an oversized hand guard to protect your hand from slipping to the razor-sharp blade. The massive blade features genuine Damascus steel construction, which gives this warrior sword an ancient look and feel. As each blade pattern is different, each one of these top-quality swords looks like a one-of-a-kind piece. The handle features heavy wire wrapping with an elongated pommel on the end. It comes with a leather belt sheath so you can wear it at your side just like the ancient warriors would have worn it. 18-1/2" blade; 24" overall. I bought this in a BOGO sale. One of the blades was really nice. The other one was OK. Both are damascus blades, because I sharpened one of them, and the 'new' edge had layers. This sword is absolutely beautiful! The Damascus steel is quite a sight!and every part of the sword in made of it! not only the blade, but all metal parts of the sword with the exclusion of the wire that wrapped the handle, it may be made of it too? can't tell. I've been looking at these for awhile and when they came up in a bogo sale I had to get them. I'm totally satisfied with the quality of both the swords and the sheaths and the price was unbelievable. I buy sell and trade knives and have just started getting into swords. I would love to keep these but if there's a profit to be made there gone. just received 2 of these today, and once again I'm very happy with my purchase this is the 5th recent purchase from BudK and I've yet to be disappointed in what I got these short swords are beautifully made, solid in construction, no loose connections and feel very good in the hand. Kudos BudK for another great addition to my collection. if you are looking for a dual short sword set look no further this sword is great for that. i have not bought this sword. but i can tell buy looking at this. is that on true damascus steel you cannot see that kind of pattern without shineing a flashlight on it at low power on a angle. if you used sandpaper it would come off. this is just the pattern of it. 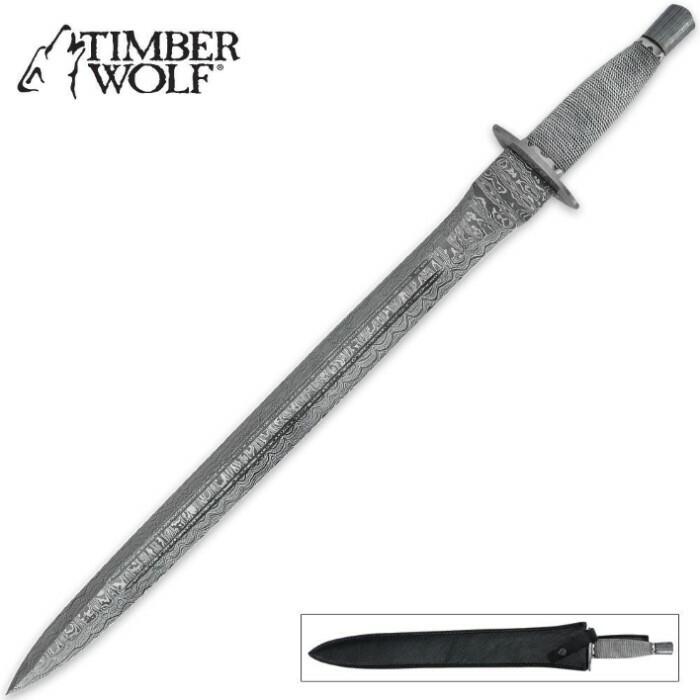 im not saying that this is a bad short sword but the title should say damascus pattern. also since its only has a half tang idk how well it would be for cutting use. I agree with the other reviews in that this is a very nice blade. I don't have any complaint about the sheath either. I got 2 of these in a BOGO deal so I won't complain about one of the sheaths having a slight oil stain either. My 4 stars instead of 5 is because slapping the sword against my leg I feel a bit of what feels like flexing making them feel a little thin. Could be a result of the BOGO deal. Could be I don't know what a sword should feel like. Anyway, I'm very pleased with them. amazing sword, feels great right out of the box. The sheath is sturdy and the blade looks amazing. The only thing wrong is the clip that holds the sword in isn't long enough to buckle it, but other then that worth every penny. Good grief this a wonderously buetiful blade!! What is all the complaints with the shieth? Mine is fine, no scrathes, our lose threads... and while not Full grain leather of stupendious quality, MINE is very nice looking. It will lo0ok great on my cigar and blades, wall! Great value with 25% off. Thanks kids, I am over 5 star satisified!! (where are the rest of the stars??? I was amazed and very happy to see the quality of the steel. It's the real deal. Very nice Damascus steel. The sheath, however, is not the same high quality. But, then, I didn't buy it to wear. The Good: A Beautiful wavy Damascus Steel Blade. Never mind the description, the guard and pommel cap are also Damascus steel also, so VERY GOOD. The not so Good: The sheath is a laminate of leather over synthetic leather, for a full grain look at a cheaper price, and it would surprise me if it will last even 50 years. If that bothers you, Just hire your local shoemaker to make you a thick leather one. i It may cost you twice what you just paid for the whole sword though.